Septikon is set in a retro-futuristic atmosphere, resembling the atmosphere of such popular games as Fallout and BioShock. The two players each take the role of owner and leader of an orbital mining battle station. They are hunting for uranium deposits in an asteroid belt far away from civilization. There is not enough uranium for everyone, so the players fight brutal battles with other explorers over every asteroid. By using diverse offensive and defensive measures and the a loyal crew of clones, a player has to try everything to put his opponent out of action first. Septikon is a truly unique game: It is turn-based and belongs to the “Tower Defense” genre. 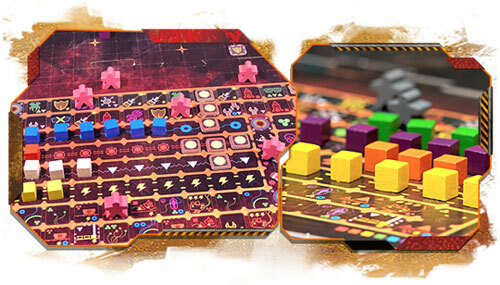 As space explorer you must not only protect your own ship and goods but also send waves of attackers towards your opponent! Send him down in flames and get his valuable uranium! It is original. Are you looking for something new? We guarantee that you have never seen a game like this one before! It is well developed. Like a good brandy, our game was in development for 12 years — that's 12 years of constant testing and thousands of matches played. It is dynamic. Sid Meier said, “A game is a series of interesting choices.” Septikon won´t overwhelm or bore you. Each turn, a player has a limited amount of choices, however, each individual choice is important and may be critical! This means that there is hardly any downtime in Septikon. Photo of Russian edition of published game with wooden figures. The new edition will use plastic figures like those below. Burning. Burn through the opponent’s battle station with your lasers, cutting him off his supplies, ammunition and oxygen. Suppression. Destroy his battle sections and maintenance modules, block his shooters and stop him from recovering. Landing. Attack your opponent with a squad of fully armored and equipped BioDrones. Let them rip through his defenses! Exhaustion. Destroy your opponent’s strategic resources with quick targeted attacks and sneaky diversions. While he is trying to recover, create an invincible invasion force! Massacre. Focus your entire production on creating nuclear charges. Suppress the opponent’s defenses and blow him to smithereens! It is different. Septikon is a rarity in these days – a tactical game designed for two players. A quick look at the game and its components. 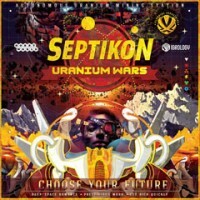 Add a Review for "Septikon"
2 rules booklets. One, consisting of just 2 pages, contains the Intro Game Rules, the other, the full rules (8 pages).